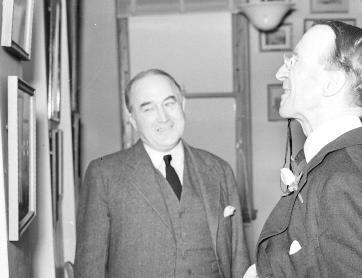 Lord Tweedsmuir viewing photographs at the City Archives, March 1939. Detail from Item # Port N169. No day passes at the Archives when we don’t mention Major Matthews or appreciate his legacy. The results of his efforts to document and collect the historical records of Vancouver’s development form the cornerstone of our holdings, and the importance of his role as advocate for their continued care and preservation cannot be overstated. 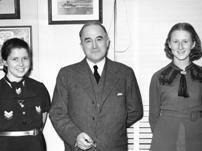 The City Archives staff, October 14, 1937. Detail from Item # Port P270. 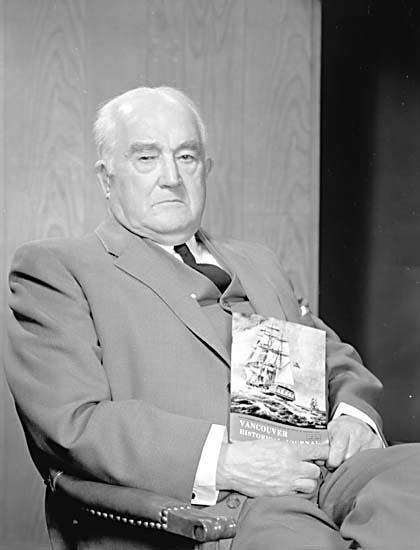 Born in Wales on September 7, 1878 and educated in Auckland, New Zealand, James Skitt Matthews came to San Francisco at the age of 20 to make his fortune. Moving up the coast he stayed briefly in Tacoma, Seattle and Victoria before making Vancouver his permanent home. Over the course of his working life he held a variety of positions, including 20 years with Imperial Oil. He joined a local militia unit in 1903 and during the First World War was transferred to regular forces. He served in Europe from February 1916 to May 1918, eventually attaining the rank of Major, a title he would use for the rest of his life. After the war he operated his own scow and tug business, eventually retiring in 1924. It was at this stage in Matthews’ life that his full attention was turned towards the collection and documentation of the City’s history. After filling every nook and cranny of his home in Kitsilano, he began a prolonged campaign to find a permanent and more appropriate home for the voluminous and steadily growing collection of documents, photographs, and other memorabilia he had amassed. He first attained space in 1931 in the attic of the old City Hall, a location that by all accounts was cold, dirty, and inadequate for the storage of irreplaceable historical documents. By enlisting the help and support of prominent local personalities, this archives was moved several times: in 1933 to the temporary City Hall in the Holden Building on East Hastings, in 1936 to the new City Hall, and in 1959 to the Main Library. Portrait of Major J.S. Matthews. Williams Bros. photographer, 1961. Detail from Item #Port N941.2. During this period of frequent moves Matthews also was embroiled in a controversy with the Library Board over ownership of the materials, at one point even relocating the holdings back to his home in protest. 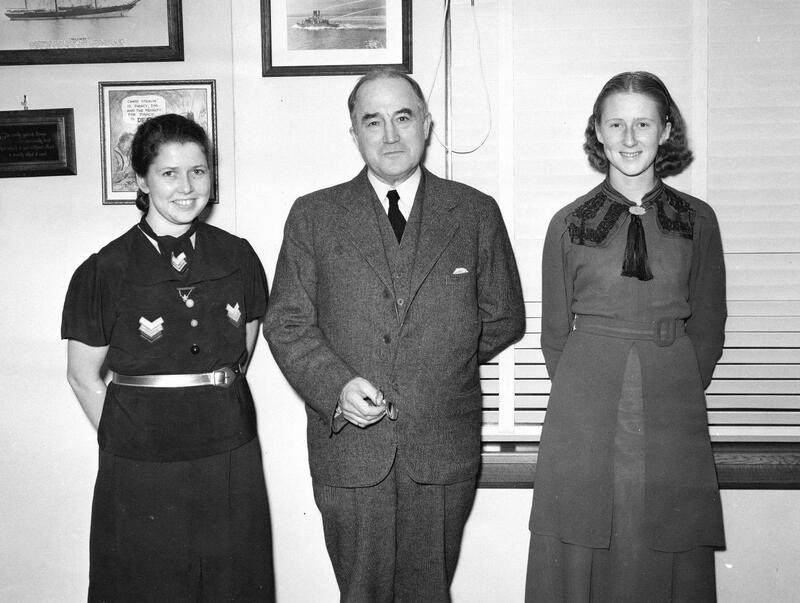 In June of 1933, he was finally and unequivocally appointed by City Council as City Archivist, a position he retained until his death at the age of 92, in 1970. Today, many of Matthews’ documentation projects are still some of the most heavily utilized resources in our holdings. For example, his Early Vancouver volumes, which consist of transcribed interviews conducted over a period of years with Vancouver’s earliest pioneers, are accessed by researchers almost daily, as are his “topical and categorical files,” which document a breadth and scope of local historical subject matter that is almost unimaginable. Ever the outspoken advocate for a permanent, dedicated place for the Archives, Major Matthews did not live to see the completion of our current facility, which opened to coincide with the provincial centenary in 1972. Named in his honour, the Major Matthews Building was the first municipal archives repository in Canada to be built for the sole purpose of housing a city’s archives, a fitting legacy for a man so dedicated to preserving for posterity the documentary heritage of our city. By Megan Schlase. From the City of Vancouver Archives Newsletter, October 2006.